ZT Tabs is an ultimate Joomla Tabs module to help you deliver the best content presentation to users. ZT Tabs supports all categories and modules in any positions. If you are looking for a tabs solution, this is for you. ZT Tabs can be set to display either categories of your choice or modules base on the position you select. It support unlimited item to be displayed. Also, ZT Tabs support theme select for your styling needed. You can create as many theme as you like and select them in module manager. All of control parameter can be set such as duration of transition, switching effect between tabs, auto adjust height of the tab content. 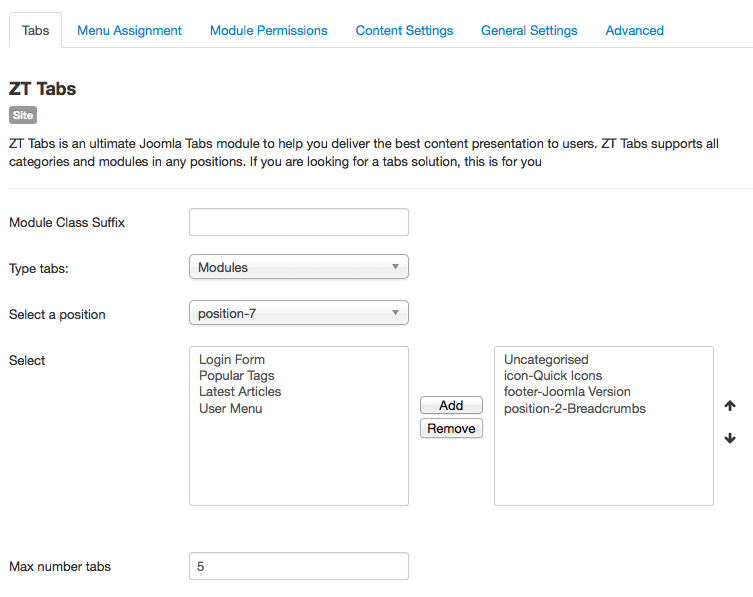 This module was built for joomla. For any further support and questions or any bug, suggestion features, please post it on our forums, we will try our best support or fix them. Easy tabs configuration from any categories and modules in any positions. Multiple modules configurations, using unique module ID. ZT Tabs comes with a lot of different styles.